If you want to make clothes from the late 14th-early 15th century that is. As must be obvious to anyone reading this blog I prefer the early 14th century rather than the later, and generally the High Middle Ages, before the Plague. I haven't made a Gothic fitted dress for myself since the late 90s, but the method for making a self supportive bodice is good also for 16th century gowns, like my blue wool gown. 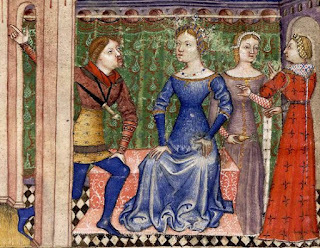 And there's so much more useful information about clothing in the Late Middle Ages that it's worth having a look even if you don't particularly want a fitted late 14th century gown. I realize that the main reason that I haven't posted about Tasha Dandelion Kelly's web site is that I assume that everybody already knows about it. But maybe not everybody does. So! Go there!